Need a 'Knocking or Clunking Noise When Driving' Inspection? A knocking or clunking noise when you are driving along, especially over bumps, can indicate an issue in your vehicles suspension system. This can affect the handling and braking effectiveness, and can lead to failure in emergency situations. You may also notice a decrease in ride comfort. The suspension system is designed to absorb any bumps and undulations in the road without causing too much disturbance to the occupants inside the vehicle. It also allows the vehicle to handle correctly and keep the tyres firmly planted on the road surface. The suspension system is made up of springs, shock absorbers, bushes and linkages that can wear out and create noises over time. Ball joints are located in the suspension system that allows for a smooth ride and superior control over the vehicle under all road conditions. They connect the vehicle’s hubs to the rest of the suspension components. When these begin to fail, they allow excessive movement of the wheel and suspension, which creates a clunking noise. Failing to replace noisy ball joints may cause a loss of steering and therefore need to be inspected and replaced as soon as a noise is heard. An anti-roll bar (or sway bar) is fitted to the front and rear of most vehicles to eliminate excessive body roll when cornering. These bars are connected to the other suspension components via stability link rods. If there is an issue with these links or the rubber mounts that hold the sway bar, a knocking or clunking noise may be heard when cornering or going over bumps. A strut mount does what its name suggests, and mounts the suspension strut to the body of the car. These are usually made of rubber and include a bearing to allow for smooth turning and vibration absorption. When these are worn out, it may cause a knocking or clunking noise, steering bind and wheel alignment angle changes. What’s Involved in the Knocking or Clunking Noise when Driving Inspection? The mechanic will road test the vehicle to determine where the noise is coming from, and then carry out a full inspection of the suspension system. This will include the springs, shock absorbers and other suspension arms. Once the source of the noise is located, a detailed report will be provided with a quote for necessary repairs. 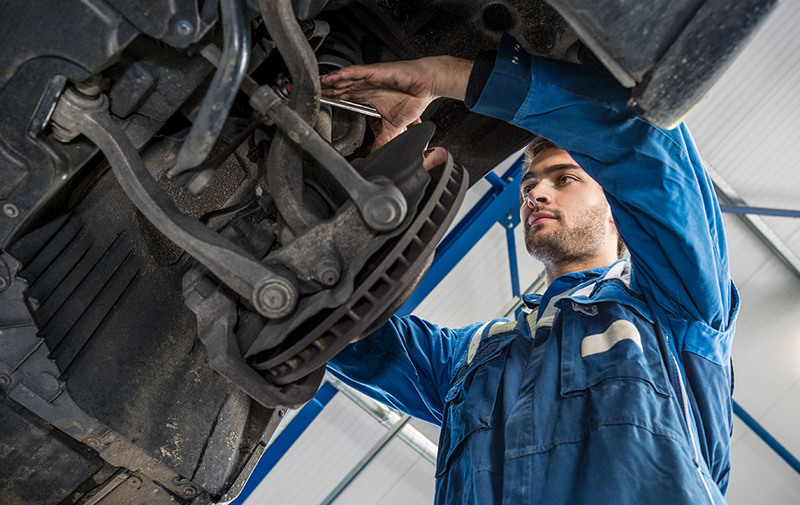 Once a suspension component has worn out, it is imperative to have it inspected and repaired as soon as possible to ensure the safety and stability of your vehicle on the road. Failing to do so may cause a loss of steering or control when you are driving, endangering you and your family as well as other motorists.